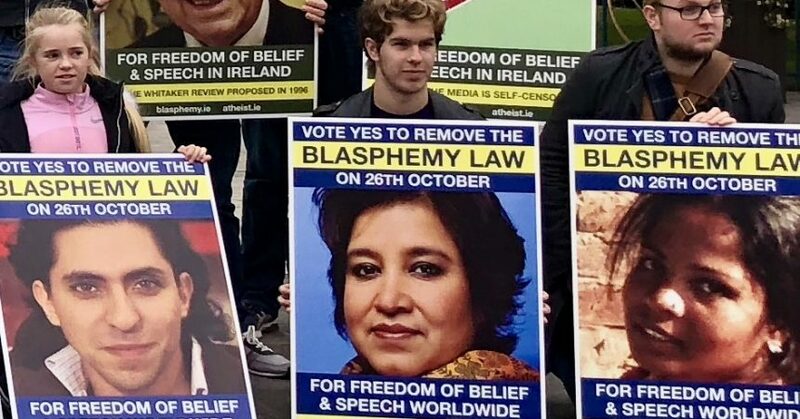 One of the arguments that Atheist Ireland has made, in support of removing the Irish blasphemy law, is that repressive regimes have used our law to politically justify their use of blasphemy laws, and to attempt to spread blasphemy laws around the world. Here is the most significant example of this in action, in which the 56-State Organisation of Islamic Cooperation at the United Nations, led by Pakistan as their spokesperson, proposed that all United Nations States should adopt the wording of Ireland’s blasphemy law. On 9th July 2009, the new Irish Defamation Act was passed, containing the new Irish blasphemy law. From 19th to 30th October 2009, a Committee of the United Nations Human Rights Council held a session to discuss complementary standards among UN States to collectively combat racial and other discrimination. Ireland was present at that session, just months after we had passed a new blasphemy law that did not comply with our international human rights obligations. This is a link to the Report of that Committee, on 21st January 2010, to the thirteenth session of the Human Rights Council. The Islamic States took this wording directly from the definition of blasphemy in the newly-passed Irish blasphemy law. So Ireland was supporting a proposal to ensure that all States in the United Nations comply with human rights law obligations, while we had just passed a blasphemy law that did not comply with those standards, and the Islamic States were proposing that all States in the United Nations should adopt the definition of blasphemy from the Irish law. “But it seems that Minister Ahern did not realise the worldwide ripple effect that was to be prompted by a small piece of legislation in a small western democracy. The law has been seized upon by groups from the extreme left to the extreme right of the political and religious spectrum across the globe. The Organisation for Security and Co-operation in Europe (OSCE), a 56-nation regional security group, warned that the Irish blasphemy law could flout international standards on the freedom of speech and have a ‘chilling effect’ on the freedom of expression. Elsewhere, a group named Atheists Ireland launched a controversial online campaign opposing the legislation which garnered worldwide attention. They posted 25 written or and uttered quotations which have been categorised as blasphemous under various laws, attributed to figures including Jesus Christ, Prophet Muhammad, Pope Benedict XVI, Mark Twain, Salman Rushdie, and singer Bjork. Yet, while the law was largely criticised and condemned in the West, other groups decided to hold up the Irish blasphemy law as an international model. We welcome this initiative by the European Parliament and the legitimacy of its requests to Pakistan. But we draw the Parliament’s attention to the need to review European legislation on this subject at the same time. It is not very coherent to ask another country to carry out a thorough review of its blasphemy laws while continuing to accept the existence of a law in Ireland that criminalises blasphemy and makes it punishable by fines of up to 25,000 euros. More recently, in 2016, an African book titled ‘Global Perspectives on Europe: Critical spotlights from five continents’ included a chapter by Mauro Gatti of the University of Bologna, titled Normative or Hypocritical? Contradictions between the EU’s External promotion of Human Rights and Member States’ Policies. “In 2009, Pakistan submitted a proposal to the UN ad hoc committee on the elaboration of complementary standards, according to which states parties should have prohibited by law ‘the uttering of matters that are grossly abusive or insulting in relation to matters held sacred by any religion thereby causing outrage among a substantial number of the adherence to that religion’. This year, the newly-elected Prime Minister of Pakistan, Imran Khan, has vowed to defend the country’s blasphemy law, which human rights groups routinely describe as one of the most abusive and discriminatory blasphemy laws in the world. He has also pledged to revive efforts by member States of the Organisation of Islamic Cooperation to establish blasphemy as a crime under international law. Last month an unprecedented international coalition of people, accused of blasphemy in their home countries, wrote an open letter calling on the people of Ireland to vote to remove our blasphemy law in next week’s referendum. The 23 signatories come from across 12 countries, all of which have some variation of blasphemy law on statute. They are Bangladesh, Egypt, Greece, India, Indonesia, Iraq, Morocco, Nigeria, Pakistan, Palestine, Saudi Arabia, and Sudan. This is just a small sample of the international impact that the Irish blasphemy law has had, both on Ireland’s reputation and on the lives of victims of blasphemy laws around the world. It is not the only reason to remove our blasphemy law, but it is an important one.